Charles Abrahams is a world-class lawyer who sued multinationals for colluding with the apartheid government, but at twelve he was determined to become a world-famous heart surgeon. Then a school inspector shattered his dream: coloured children from the Cape Flats ‘should not aim too high’. 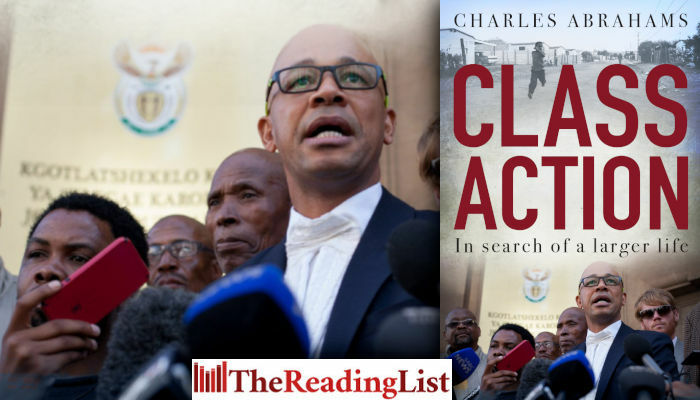 Class Action: In Search of a Larger Life is the story of how Charles aimed high anyway, despite a childhood that included forced removal, dire poverty and the deep sense of shame of being neither white nor a ‘white coloured’. As one of eleven children in a poor family, he experienced constant hardship and family strife. Violence was ubiquitous: his street was notorious for its gang fights, his father abused his mother at home, and schoolteachers beat darker-skinned children like him. Charles wanted a larger life, and he found it through student politics, anti-apartheid activism and reading. He studied relentlessly, finding not only formidable political weapons, but a means to delve into the damage apartheid had done to his personal identity, self esteem, sexuality and morality. He went on to qualify as a lawyer and, after defending local gangsters, he sought to do good through human-rights and class-action law. He has since spearheaded some of South Africa’s most historic, groundbreaking lawsuits, pursuing justice for ordinary citizens whose lives were ruined by powers too profit-driven to ever think about them.